John McDonogh High School’s charter board cut short its monthly meeting Tuesday night after a shouting match erupted between board members and an audience of about 50, including teachers, students and neighborhood activists. Snippets of video promoting the Oprah Winfrey Network’s new program, “Blackboard Wars” proved especially provocative. They depict the school as deeply troubled. “It was like two parents stuck in a divorce who put the kids in the middle,” Kwame Smith, an educator who ran unsuccessfully last fall for a seat on the Orleans Parish School Board, said about Tuesday’s meeting of the school’s charter operator, Future Is Now: New Orleans. An official goal of the meeting was for the board to sign a memorandum of understanding with the John McDonogh Advisory Committee, a community organization formed to support the charter organization and address concerns like those aired Tuesday, including lack of supplies and student resources. “People are well-intended, but we won’t get anything accomplished if there’s no organized forum with which to address these issues,” said Clarence Robinson, a John McDonogh alumnus who chairs the advisory committee and is a member of the charter board. Goals specified in the memorandum include augmenting staff and financial resources, organizing volunteers and holding conflict-resolution meetings. The signing was delayed, however, when public criticism of the board degenerated into tears and screaming among students, parents and teachers. “When you go through change like this, I expect opposition to the change that we have here,” school principal Marvin Thompson said. In a lengthy speech Thompson addressed controversies that have been brewing since last year, when the Recovery School District overruled calls to keep the charter in local hands and awarded it to Future Is Now Schools, a national organization. “I’ll be frank with you and I don’t mean to be a smart aleck and I don’t mean this in any other way—I don’t care how you feel about me,” Thompson said, addressing his critics. “I really don’t. I didn’t come here for any grown-up in this room,” he added, by way of saying that students are his priority concern. Thompson added that he finds it “appalling” that his efforts to turn around a failing and sometimes violent school have been met by backlash and criticism. As the outbursts erupted, Thompson had just finished outlining a plan to improve attendance, which he said hovered between roughly 75 and 80 percent on any given day. His goal, he added, was to get the attendance rate up to 90 percent. To achieve that number, he laid out a plan to help kids make up missed days. Students will be able to make up lost time by attending an after-school program from 4:30 p.m. to 6 p.m. on Mondays, Tuesdays and Thursdays; from 1:30 p.m. to 6 p.m. on Wednesdays and on Saturdays from 8 a.m. to noon, Thompson announced. Every four hours will count as one school day. Thompson said he was disappointed to discover how many absences some students have accumulated—15, 30, even 40 or more. Thompson also announced plans for a new student advisory board at the school, as outlined in the school’s agreement with the charter organization. The board is meant to help teachers connect with students about issues such as study skills, conflict resolution and attendance. The board also addressed plans to transfer a science teacher and a history teacher from John McDonogh to Walter L. Cohen High School. Future is Now runs grades 11 and 12 at Cohen while the school transitions to a charter held by New Orleans College Prep. 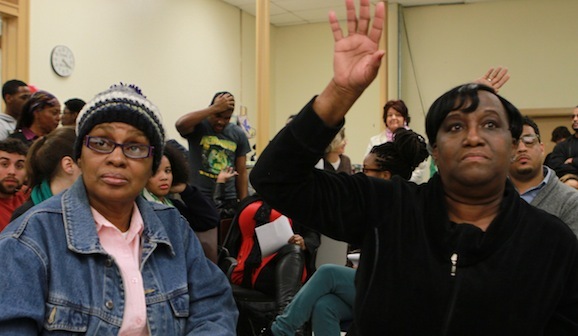 Many parents and community board members, eager to address issues not outlined in the board meeting’s agenda, stayed nearly two hours after the meeting officially ended. The Oprah documentary, segments of which were shown at the meeting, drew considerable comment. Parents also complained about the building’s disrepair and lack of library books. They said they wanted more input on spending. At least two students spoke out in favor of Future is Now, however, citing an improved curriculum, more attentive teachers and better morale. After a long night of heated discussions with community members, filmmakers, board members and former employees, at least one parent urged that the focus be brought back to the students.